These days, the glorious surrounding parkland and gardens have been lost to modern houses and the site of the building itself is a school. In 1824 the house, still known as Rockfield House, was offered for let by the Freemans, and was described as a substantial mansion with stabling of offices of every description for the accommodation of a large family. There were two walled gardens, well stocked with fruit trees, lawns and shrubberies, as well as two orchards. The accommodation included entrance hall; drawing room; dining room; breakfast parlour; butler’s and other pantries, servants hall; kitchen; Brewhouse; dairy. There were eleven bedrooms, two dressing rooms, water and other closets. Outside was a good coach house with granary over; two three stalled stables; a cider mill; two barns and other outbuildings. A good point was the fact that coaches passed daily from Hereford, through Worcester to London. The Freeman family returned to Rockfield House and remained in residence for many years. The second escutcheon was engraved with the armorial bearings of Mr. Freeman, and on the third, his initials. From the centre of these rose two entwined vine branches, surrounded by the tendrils of the hop. Five shoots, laden with fruit, stretched out from the centre of the vine and terminated in five elegant candelabra. The parent stem continued upwards with the foliage spreading out in a crown supporting a glass vase. 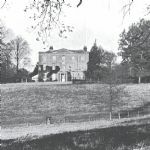 Sir Herbert Croft bought Rockfield House from the Freeman family, and in 1866 decided to rename it Lugwardine Court, due to there being another Rockfield House near Monmouth which was causing confusion. The Croft family are better known for their bigger and grander residence…….Croft Castle.